The picture of Riber (above) was taken from the garden of 45 (later 12), Lynholmes Road, on the first days of the Hurst Farm Estate development in the 1950s. It certainly spoiled the view of Riber and Mornington Rise after the houses were built. 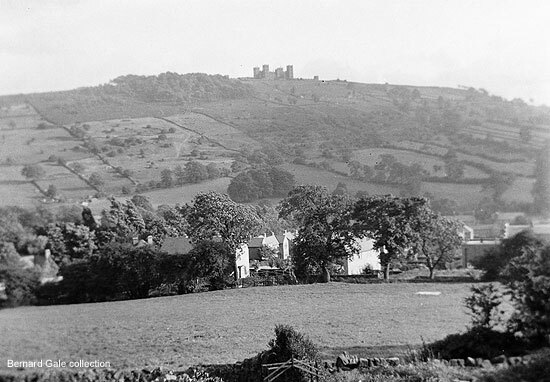 At a meeting of Matlock UDC in February 1948 the Council's Clerk, Mr. N. S. Brooks, "reported that the Ministry of Health had confirmed the Hurst Farm, Matlock, compulsory purchase order. The Hurst Farm Estate has been acquired for housing purposes and the lay-out provides for 499 houses, bungalows and shopping and community centres". A gentleman who worked for a short time for the Surveyor's department of Matlock UDC and dealt with the estate in 1951 has said that the estate was built around 1949/1950 by George Shipman and Company whom he believes were based in Belper. Lynholmes had been built over twenty years before. 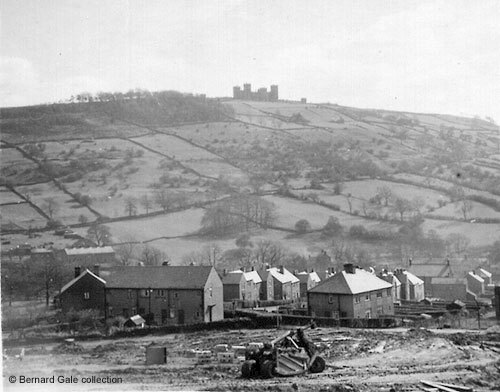 In May 1925, at special meeting of the Matlocks Urban District Council with Mr. J. Shaw presiding, a letter was read from the Ministry of Health intimating that they approved of the suggestion of the council to grant assistance to private enterprise in house building, and also for the erection of 24 houses on the Lyn Holmes site by the Council, the subsidies to take the form of lump sum grants of £100. The development was for "working class houses". It was decided to appoint Mr. J. Simpson architect to the council scheme. The field in front of the house in the top photograph belonged to an old character called Johnny Else who lived in an old farm house (Lime Tree House) where the shop opposite the Lindens, (formerly Nalgo House), was sited on Lime Tree Road. He used to have the local lads chopping logs for him and also haymaking in the field shown. Below is a similar view, taken when the leaves were on the trees in about 1947. On the right you can see part of the Drill Hall on Lime Tree Road. The photograph was taken using a Kodak Box Brownie Camera that was made in the 1920s. For a time at the beginning of the First War the fields were used by the Army. There is photographic evidence that show Army officers' tents in one of these fields, surrounded by snow, in 1915. They probably belonged to either the 2nd or the 5th West Yorkshires as both regiments had arrived in the Matlocks in March 1915. Both photographs and information kindly provided by and © Bernard Gale. Additional research, written by and © Ann Andrews. "Derby Daily Telegraph", 25 February 1948. "Derby Daily Telegraph", 26 May 1925. Letterheads of Local Businesses, 1900-1949 (5). The Else family were at Lime Tree Lane and/or Lime Tree House in the 1871 census | the 1881 census | the 1891 census | the 1901 census. Ann Else, John Else's mother, can also be found farming at Lime Tree House in Kelly's 1876 Directory | Kelly's 1891 Directory | Kelly's 1895 Directory | Kelly's 1899 Directory | Kelly's 1908 Directory. His sister advertised in Kelly's Directory 1912 | Kelly's Directory 1916. A young Johnny Else can be found on Matlock: Coup - Else Marriage at St. Giles', 1890 and Matlock Bath: Else & Marsh Wedding, Glenorchy Chapel, 1915. John Else and his elder brother William were still living at Lime Tree House Farm/House in 1939 (from the 1939 Register). With thanks to Susan Tomlinson for finding the photos mentioned. The "Derbyshire Advertiser and Journal" of 5 March 1915 describes the arrival of the 2nd W. Yorkshires on a day of bitter wind, hail and sleet. The "Harrogate Herald" of 10 March 1915 names a Yorkshire lad, a private in the 5th Yorkshires, who was based in Matlock.